BeerViking: What does Winter Beer mean to you? 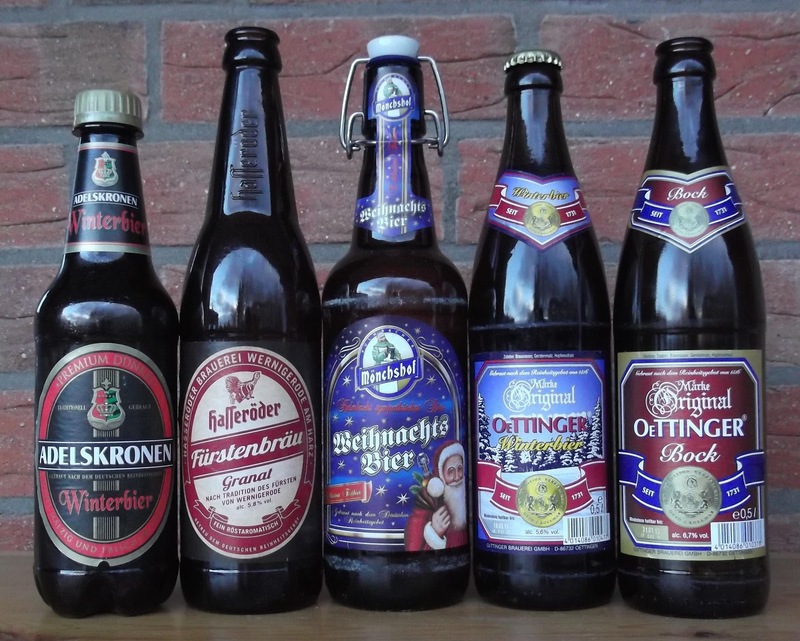 Winter and Weihnachtsbiers, part two: When you think of Christmas and beer, what comes to mind – something rich and dark, or something golden and perhaps even a bit flowery? 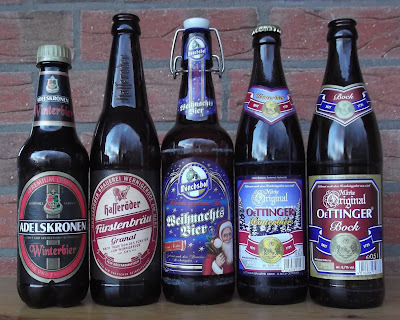 When last I looked at German Weihnachtbiers and Winterbocks, they were definitely in the former camp, but to my surprise there are other brewers who fall into the latter. One such is Kulmbacher Mönchshof, which is part of the German Brau Holding International group. 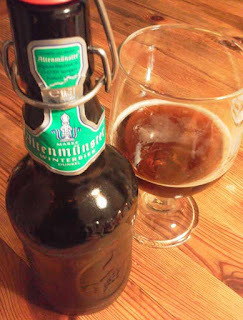 Its standard beers – Pils, Bayerisch Hell – are well-made but fairly typical; where it redeems itself for me is with its excellent Kellerbier, an amber-coloured brew resembling a lagered bitter ale. Mönchshof is not alone in this. Carlsberg is touting the bizarre concept of a Tuborg Weihnachts Pilsener (I'd like to try a bottle, having seen from Ratebeer that it's not a Pilsener but a Vienna, but so far I've only seen it on sale in six-packs) and then there's Oettinger's Winterbier, which is very nice with pleasing green hop and toffee-nutty notes, but is more of an amber lager – perhaps even another Festbier, given its 5.6% strength. Incidentally, quite a few people are snarky about Oettinger because it sells its beer so cheaply – typically €0.50 (40p) for a half-litre – and operates big industrial breweries, all of which has made it the largest beer producer in Germany. On the other hand, it is still locally owned and operates a very efficient single-tier business – it is famous for not advertising and for cutting out the distribution channel. Anyway, it has not one but two seasonals, the other being a Bock. Weighing in at 6.7%, Oettinger Bock is dark amber with a malty and slightly raisiny nose, and a nice balance of grainy sweetness, bitterness and roasty malt. Yup, that'll do nicely for a cold winter evening. Also nice stuff, though at twice the price, is Altenmünster Winterbier Dunkel. Packaged in Altenmünster's trademark decoratively-moulded 500ml flip-top bottles, it balances the typical toffee-ish Dunkel flavours with the spicy hoppy bitterness that's familiar from the various (and somewhat samey) Altenmünster blonds. By the by, the German word that these shops use a lot is "billig", which seems to have more of a sense of "inexpensive" than "cheap". And while no-one wants to be thought of as cheap, everyone loves a bargain. That means everyone shops at Aldi, Lidl, Penny and the others, albeit sometimes in addition to one of the more up-market chains. Anyway (again), usually it's just the normal boring German choice of Pils or Weizen, but our local Penny Markt now also has Adelskronen Winterbier, at €1.99 for six plastic bottles. This is a winter Dunkel brewed specially for Penny by Fankfurter Brauhaus – that's Frankfurt an der Oder by the way, right on the (modern) Polish border, not the better known financial centre down south – and it is rather good. It's a proper roasty Dunkel, with nutty plummy hints and a dryish body. 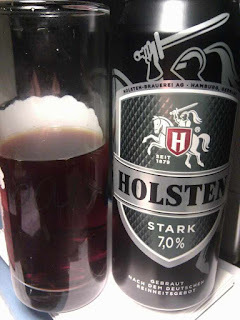 Both are certainly better than Carlsberg's other seasonal attempt, which is Holsten Stark. The best thing about this 7% Dunkel Doppelbock is the cool can design, which takes the usual Holsten horseman logo and recasts it in black, silver and gunmetal-grey. The dominant flavour is burnt sugar, there's a bit of roastiness, and the alcohol cuts the sweetness a bit, but overall it is not terribly good. Last but not least, and showing that the multinationals – in this case AB-Inbev – can produce something decent, is Hasseröder Fürstenbräu Granat, or Princely-brew Garnet. Claimed to be in the style of an 1899 Royal Festbier, which means it'd be based on an amber Vienna lager, rather than the Johnny-come-lately golden Pilsner-alike versions, it's roasty and quaffable, with hints of toast and marmalade. I'm sure there more: I'll keep looking, and drinking! In the meantime, what's the best winter beer – German or otherwise – that you've had so far this season?